Quinns: Oh my god, Paul, it’s awful. Did you seen the news over the weekend? Paul: I did. What’s the world coming to? Quinns: I don’t know, but I know we can’t stand for it. Paul: You think so? 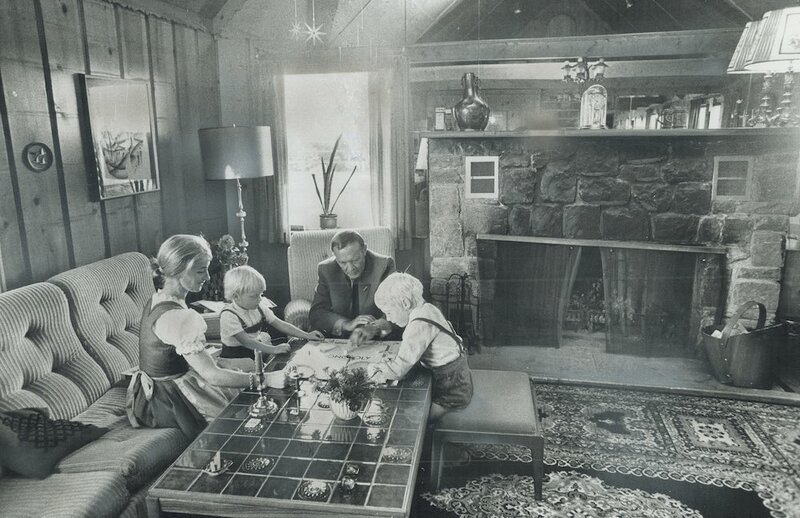 I had no idea you felt so strongly about Reiner Knizia’s Ingenious being renamed AXIO Hexagonal. Quinns: …Paul, did you turn on the TV over the weekend? Paul: No, I got the weirdest feeling that it would be rather like blasting a jet of pure sadness square at my own face. The gorgeous game pictured at the top of this article is Dice Forge! 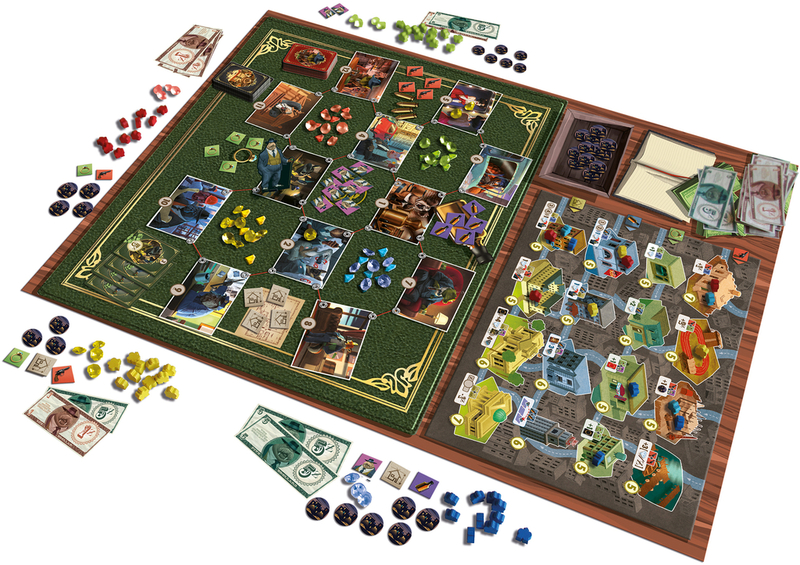 A new game from Régis Bonnessée, designer of Seasons and Lords of Xidit, that will be a showcase of revolutionary new board game technology. For example, you put one of the boards in the box and then it’s a little bit above the rest of the stuff. But that was also present in previous Libellud game Loony Quest, so we’re not so excited about that. What’s much cooler is that this is a game all about customising your own dice, and rolling them to earn gold, “moon shards” and victory points. Of course, we’ve seen that mechanic before, but this time around you’re removing and replacing the individual faces of your dice. You can read more in this official Asmodee preview of Dice Forge, but basically this makes the game a combination of Machi Koro and Mystic Vale, two games we’ve had a thoroughly lovely time with. I’d love to try this. Roll on summer 2017! Paul: I know what you like. It’s French animals involved in organised crime. You’re always talking about French animals involved in organised crime. You never shut up about it. Paul: That’s good! It’s good because Mafiozoo is on its way. If you’ve ever wanted to give a pig a gun, now is your chance. This is a game of carefully spreading criminal influence across a city, gradually gaining control of different areas that then award you bonuses which can be cashed in to further grow your power and influence. Each location is unique and offers you some special advantage, making every choice extremely important. What makes this exciting is that it’s actually one of those reliably entertaining modern re-imaginings of an old classic! In this case that’s Louis XIV, from the almost prehistoric period of 2005. Though depending upon your cynicism toward the government of feudal France, the French royal court might also be considered criminal animals. Anyway, it looks like an interesting mechanic, but also very abstract and I can’t figure out if I’m going to find it very dry or very fascinating… but I guess I’ll just have to try it! 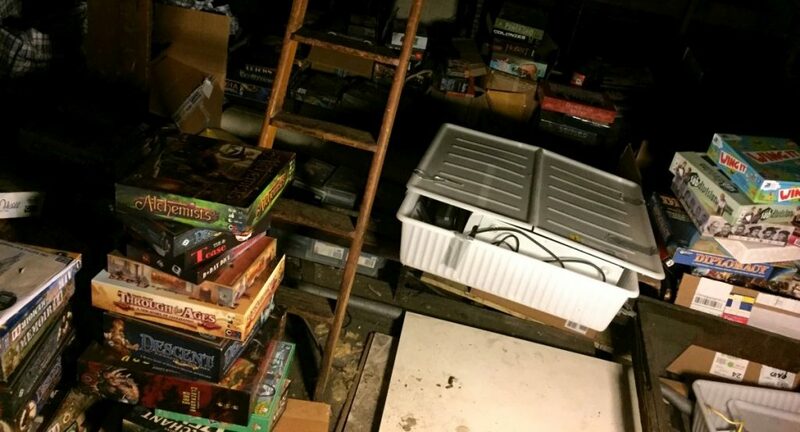 Quinns: Today’s board game industry has quite a “fire and forget” mentality, with reviewers and consumers trapped in a breathless cycle of buying games. So it makes me smile to see that the superb Board Game Geek News blog has started reposting 1999-era video show The Board Room, starting with this 90 minute series on Tigris & Euphrates, with designer Reiner Knizia on the phone. Although frankly, I’m less excited about this than I am at the opportunity to link The Long View podcast again. A wonderful counterpart to the rest of the industry, these guys delight in hanging around individual games long after the rest of us have gotten distracted. Paul: Oh wow, what a fantastic look back at the past. And you know what? I have to admit, I was expecting this to look dreadful and shonky, but it’s really not at all. It reminds me of old American cable shows, where the production might be pretty minimal, but the host knows what they’re talking about. 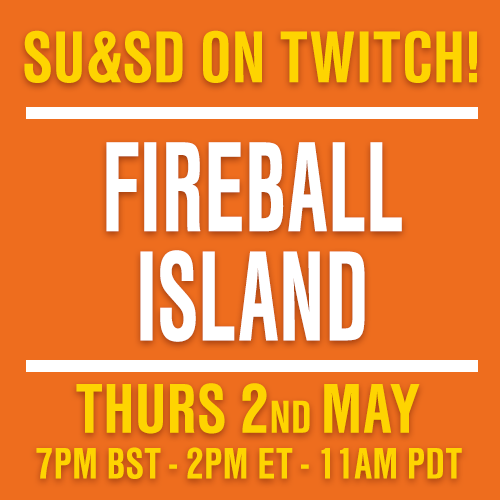 And they actually have a live call with Knizia! Seventeen years ago! I was playing Counter-Strike and learning guitar and was sad because someone had broken up with me. WHAT A TIME TO BE ALIVE. 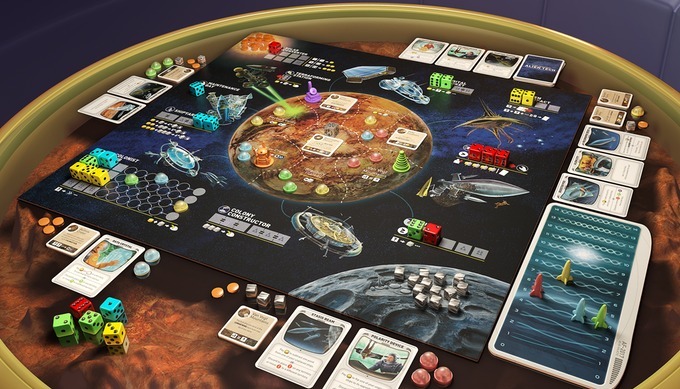 Quinns: Alien Frontiers is back on Kickstarter again! The only box so slippery that Paul and I gave up on ever filming a timely review and just posted the script online has once again come back to taunt us. Sigh. This game has better and better presentation each time we see it, eh Paul? Like an ex-lover who looks more and more beautiful each time you bump into them. A lover who now has tiny miniatures and free worldwide shipping for everybody. ”I loved you when you cities were weird little discs!” I see myself screaming, wobbly from gin. But we’re only hurting ourselves with these thoughts. Because of course, if we were a partner worthy of Alien Frontiers, we’d be happy for them, and not brooding on our own loss. Paul: It’s always lovely when we can link to interesting and unusual new things in the Games News and today we want to show you this episode of BBC Radio 4’s The Infinite Monkey Cage (also available as a standalone podcast), which is all about games. And winning at games. As so many professional gamblers will tell you, strategy and probability are extremely important, while just about every fan of games has their own preferred way of playing something that they’ll swear is definitely the route to victory. This show has some of Britain’s most interesting analytical broadcasters pulling things apart and, unlike lots of the things I get linked to in iPlayer all the time now, you can actually listen to it outside of the United Kingdom. Fun bonus fact about one of the unusual guests: I used to have Richard Wiseman’s phone number. I contacted him more than a decade ago for a feature I wrote on parapsychology and ghost photography. He’s written or presented all sorts of unusual things over the years. Quinns: Have you ever seen a ghost, Paul? Paul: Once I heard a noise in a forest that might’ve been a bear. Also, once I really honestly did hear the weirdest transmission on a radio. Nowadays, in our hyperscientific age, I seek only to explain everything. Or to see everything explained. Or to play games. Or to see games played. Is there anywhere where I can see more games being played by enthusiastic and excited people? Quinns: Aha! By now I think it’s common knowledge that Shut Up & Sit Down is pretty cautious before putting Kickstarters or other board game sites in front of y’all, but as soon as we found Girls’ Game Shelf last week we knew it was going straight in the news. Fronted by Christina Aimerito, this is a YouTube show (currently in its crowdfunded second season) that tucks a quick tutorial, a playthrough and a review into a single, slick video with awesome photography, energy and sound production. 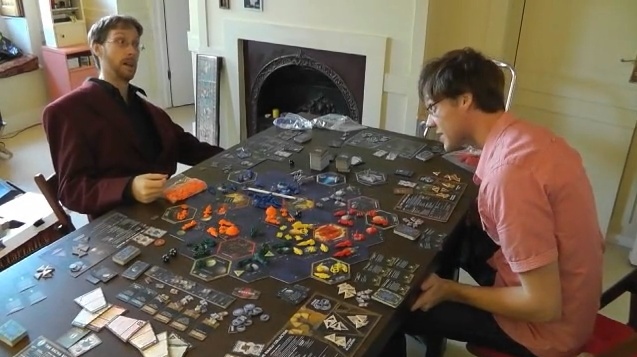 Paul: I REALLY LIKE IT WHEN WE SEE PEOPLE ENJOYING BOARD GAMES. Because oh my goodness, I’m sorry, but sometimes I still bump into videos that are so dry my doctor has to put me on a saline drip. Quinns: For dehydration, I get you. 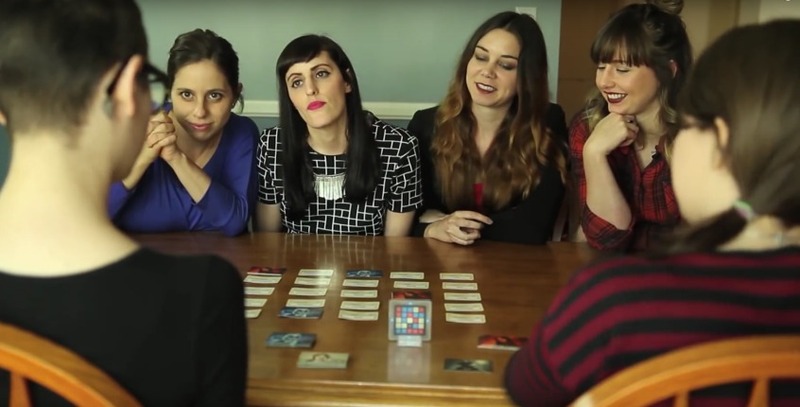 Yeah, these girls are enjoying board games, but I’d add that they’re enjoying each other’s company. I think just about anyone who works for SU&SD found Tabletop’s crazy success in 2012 and 2013 somewhat unsettling, through no fault of the show’s production staff who were clearly doing a great job. But to us, the show itself came across as people who were hired to be friendly, rather than friends who were hired. Although we can all agree that this was the best find ever. Paul: I tell you what else is good, and that’s the Board Game Mashup Twitter bot by SU&SD reader Shirley Naught. Recently readers might well have spotted us making little jokes about how a certain game might be like two others combined, or how some theoretical game combining X and Y might secretly be excellent. Well, now we can CONTINUE this indefinitely, or at least for as long as Twitter exists. Just as you’d expect, some random combinations are smarter than others, but a few are just spot on. “A solitaire game that combines Descent and Twilight Struggle, set in a junkyard.” Surely that just has to be made. CLEARLY it’s a card-driven miniatures game about a small party collecting and combining things that society has thrown away. Basically, The Wombles Strategy Game. Quinns: Paul, nobody knows what The Wombles were.